The question of how human societies evolve from small groups to the huge, anonymous and complex societies of today has been answered mathematically, accurately matching the historical record on the emergence of complex states in the ancient world. Intense warfare is the evolutionary driver of large complex societies, according to new research from a trans-disciplinary team at the University of Connecticut, the University of Exeter in England, and the National Institute for Mathematical and Biological Synthesis (NIMBioS). The study appears this week as an open-access article in the journalProceedings of the National Academy of Sciences. The study's cultural evolutionary model predicts where and when the largest-scale complex societies arose in human history. Simulated within a realistic landscape of the Afro-Eurasian landmass during 1,500 BCE to 1,500 CE, the mathematical model was tested against the historical record. During the time period, horse-related military innovations, such as chariots and cavalry, dominated warfare within Afro-Eurasia. Geography also mattered, as nomads living in the Eurasian Steppe influenced nearby agrarian societies, thereby spreading intense forms of offensive warfare out from the steppe belt. 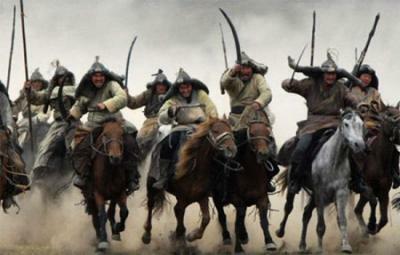 These are Mongol horsemen. Intense warfare is the evolutionary driver of large complex societies, according to a new mathematical model whose findings accurately match those of the historical record in the ancient world. The study focuses on the interaction of ecology and geography as well as the spread of military innovations and predicts that selection for ultra-social institutions that allow for cooperation in huge groups of genetically unrelated individuals and large-scale complex states, is greater where warfare is more intense. While existing theories on why there is so much variation in the ability of different human populations to construct viable states are usually formulated verbally, by contrast, the authors' work leads to sharply defined quantitative predictions, which can be tested empirically. The model-predicted spread of large-scale societies was very similar to the observed one; the model was able to explain two-thirds of the variation in determining the rise of large-scale societies. "What's so exciting about this area of research is that instead of just telling stories or describing what occurred, we can now explain general historical patterns with quantitative accuracy. Explaining historical events helps us better understand the present, and ultimately may help us predict the future," said the study's co-author Sergey Gavrilets, NIMBioS director for scientific activities. Citation: Turchin P, Currie T, Turner E, Gavrilets S. 2013. War, space, and the evolution of Old World complex societies. PNAS.